Another new release! 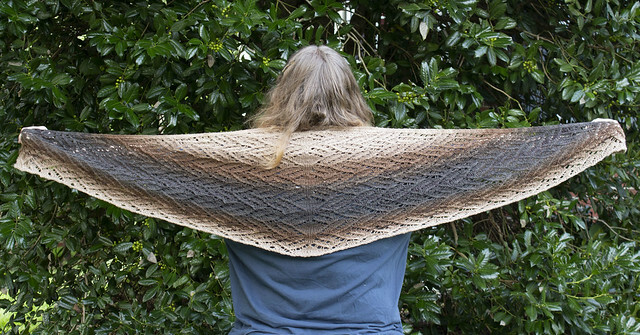 This is my Chocolate Cupcake Shawl. It gets its name from the yarn I used. It reminded me of a chocolate cupcake with an espresso frosting. This design is a higher level of difficulty. There are no rest rows with this pattern. Every single row has increases and decreases to create the tight pattern look that I wanted. It definitely is not travel knitting, because your attention will be needed. However, it the design on the shawl is written to be repeated as many times as you want. If you are looking for a much larger shawl, just keep repeating until it is the size you desire. For a shorter shawlette, just do fewer repeats. 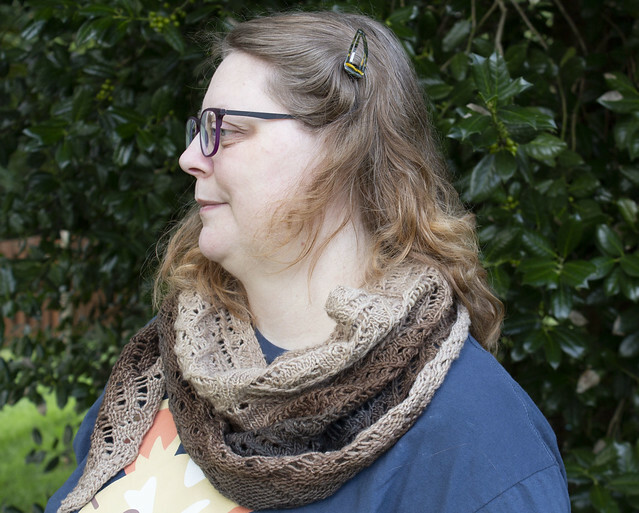 The information on the amount of yarn needed will vary depending on how large you want your shawl I used 2 skeins of the Freia Ombré Sport in the espresso colorway to create the shawl pictured here. Also, to get the gradient pictured below, I started skein one from the light end and knit until the end, then I started skein two from the dark end to match where the first one ended. I was so distracted with the holidays, that I completely dropped the ball on here! Time for me to play catch up. I released a couple new patterns at the end of November. First up is Speckled Mitts. 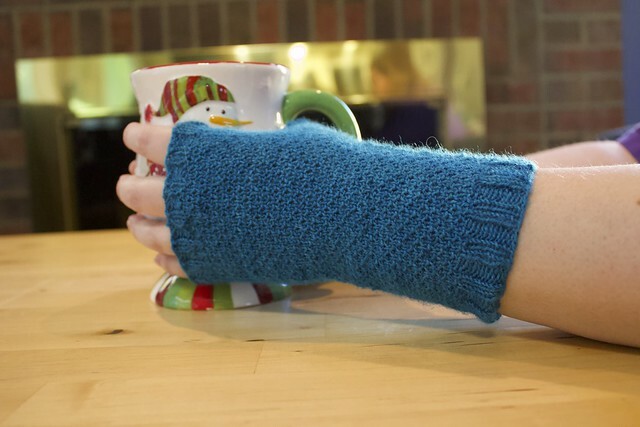 These were fingerless mittens I designed for a friend. They are a simple two stitch pattern that is very easy to remember. It gives a thicker fabric, but does leave some air holes, so they aren’t overly warm. I love the feel of the texture of these mitts. I hope you love them, too! It is almost that time of year. When gifting starts to consume a large part of our brain. To help with that, the 6th annual Gift-a-long is here! You will see stuff from hundreds of designers, and there is a great chat group going that is helping to encourage each other to get those gifts out quickly. 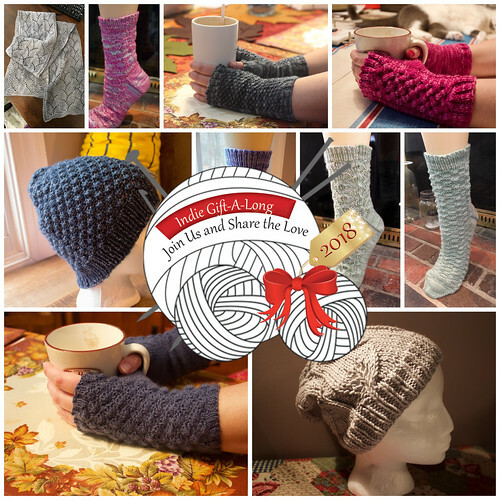 If you are interested in joining the gift-a-long group head over to Ravelry! I have also signed up to be one of the participating designers. It should be a lot of fun! New Release! Summer Evening Tee is a sport weight tee with a lace bottom that is designed to be worn on warm summer evenings. The cap sleeves give breathing room under the arms, to help with your comfort level. I have provided basic measurements for everything, however I went deeper on the bust measurements. Since every woman is different when it comes to bust size, I have given instructions on how to tailor the bust for your size. This will allow you to tailor it for your cup size, and have a tee that is comfortable and flattering. I have released another sock pattern. 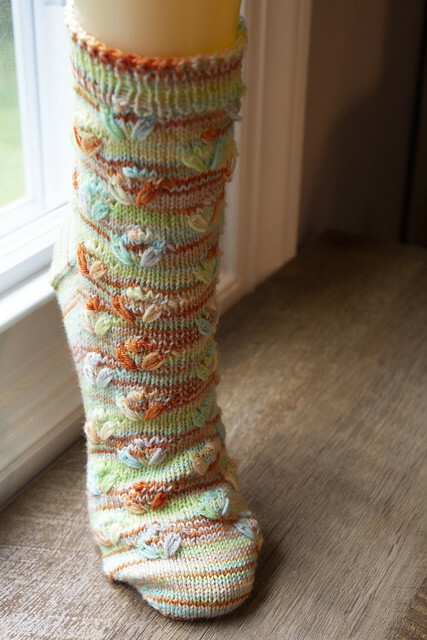 This one, called The Secret Garden Socks feature rosebud flowers that flow up the foot and legs. Instead of a traditional knit bobble, I have use a crocheted version. This means that the bobble that represents the bud will be a fluffy part of yarn, instead of a hard ball. This also makes it ideal for use on a foot. The socks will be much easier to wear in shoes, compared to having regular bobbles. The inspiration came from a club yarn I received a few months ago. It was from Into the Whirled, and is the Pakokku sock line, in the Yes! Encouragement colorway. It was such fun, bright colors that it just needed somewhere to shine. As I looked through different designs, it felt like most patterns would just fade away. So, I needed something that had the strength to not only compete with the color, but hold its own. The rosebud pattern does just that. The rosebud also makes the socks a bit thicker with the leaves and bobbles, so it makes them a great sock for cooler weather. I hope you all enjoy this pattern! New Release! Let me introduce my latest scarf. 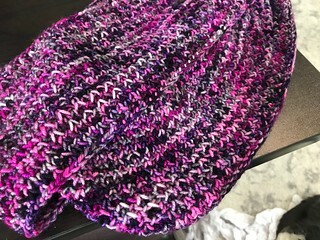 This is my Dragon Scale scarf. 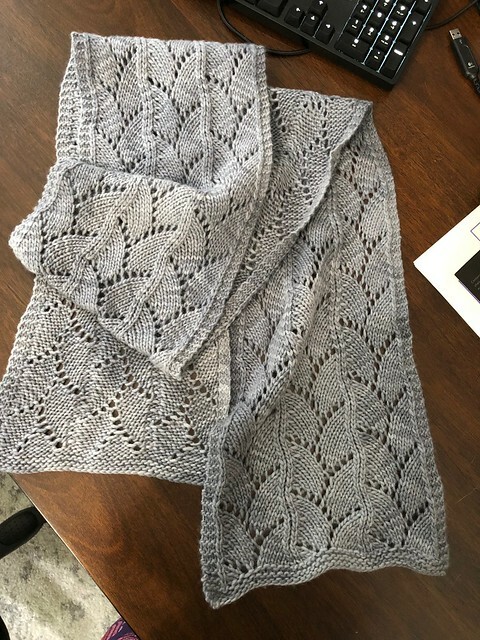 It has a wandering design that runs the length of the scarf to create a motif that looks like dragon scales. 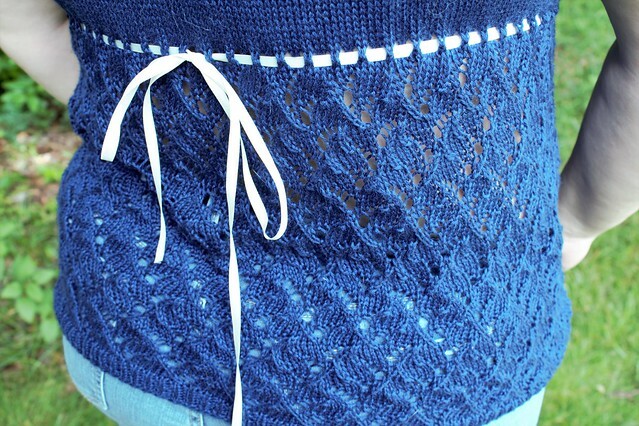 With this lace, and the yarn I used, it has a light airy feeling. While being thick and warm, it still has a bit of air flow, which allows it to be worn on days that aren’t quite as cold. For this scarf, I used Knit Picks Preciosa Tonal Worsted yarn. It only used a single skein of yarn, which was fabulous. The spring on this yarn is amazing. I knit the scarf to 64″ long, but when I did the wet blocking it ended up at 82″. An amazing amount of stretch. I am going to love this when we start seeing those cold days coming through. New Release! This is my Moss Brioche Cowl. This cowl is designed to be reversible, which means it has some different brioche stitches to make it work in the round. The brioche gives the cowl a fluffy appearance, while also allowing a heavily variegated yarn to be the star. If you aren’t using a variegated yarn? Then the brioche gets its time to shine. This cowl is knit with a single skein of sport weight yarn, approximately 335 yds. I designed the cowl to use up as much of this skein as possible, to create as little left over as possible. This will involve a bit of calculating as you go, just to make sure you are left with enough to work the bind off.